It’s almost wintertime which means bonfires are right around the corner. And who doesn’t love a hot, tasty s’more on a cold winter night, but why should we only enjoy them outside? Today we created a s’more cupcake allowing you to take your favorite outdoor recipe indoors. Preheat Oven to 350. Line your cupcake pan with cupcake liners. In a medium bowl, whisk together the sugar and Kelapo Coconut Oil. Beat in the eggs, one at a time, then stir in the vanilla. Combine flour, salt and baking powder, add to the liquid mixture and mix well. Finally stir in the milk until batter is smooth. Pour or spoon batter into each cupcake liner. Only fill about ¼ of the cupcake liner, add half a marshmallow and a teaspoon of the chocolate icing. 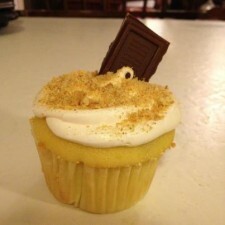 Fill the cupcake liner enough to cover the marshmallow and chocolate bar. Bake for about 20-25 minutes or until you can stick a toothpick through and it be dry. Let cool. Mix the ingredients for the icing. Stir until completely smooth and almost stiff. If you feel you need to add more confectioners’ sugar feel free. Pipe on the cupcakes. Sprinkle the crushed graham crackers over the icing and add a Hershey Bar section at the top.